Maria celebrated her 6th Birthday at the Nashville Farmer’s Market, a truly wonderful place that reflects the diversity and spirit of this city. A good friend owns Fleur de Lis Flavors, a New Orleans-style snowball and treat shop in the market, and another friend owns a catering company, peace love tea, with the most awesome of cupcakes. We put it all together and we got sweets and sugar-highs in a great space. As part of the Fleur de Lis party package, the kids got unlimited snowballs in great flavors like Tiger’s Blood and Wedding Cake and Lime. They had to hit their parents up for the dinero for the gummie worms, though. They got to run and play outside in the leaves after they were all sugared up and one-two-three, we were done. Instead of presents, we asked for donations of dog and cat food, plus treats, for the shelter in our county, which struggles mightily with abandoned animals. We collected 203-pounds of dog food, 61 pounds of cat food, almost $100 in cash, and lots of treats and toys for the animals. Our friends are generous. Of course, it was my idea — a way to reduce the amount of stuff that comes into the house. My mother, Abuelita, thought it was criminal to deny Maria of a gigantic pink haul. But, Maria was fully on board with it. She is proud of the mountain of animal food that is in the back of my Pilot and she’s enjoying the horse-riding and vet Barbies she got to pick out herself. 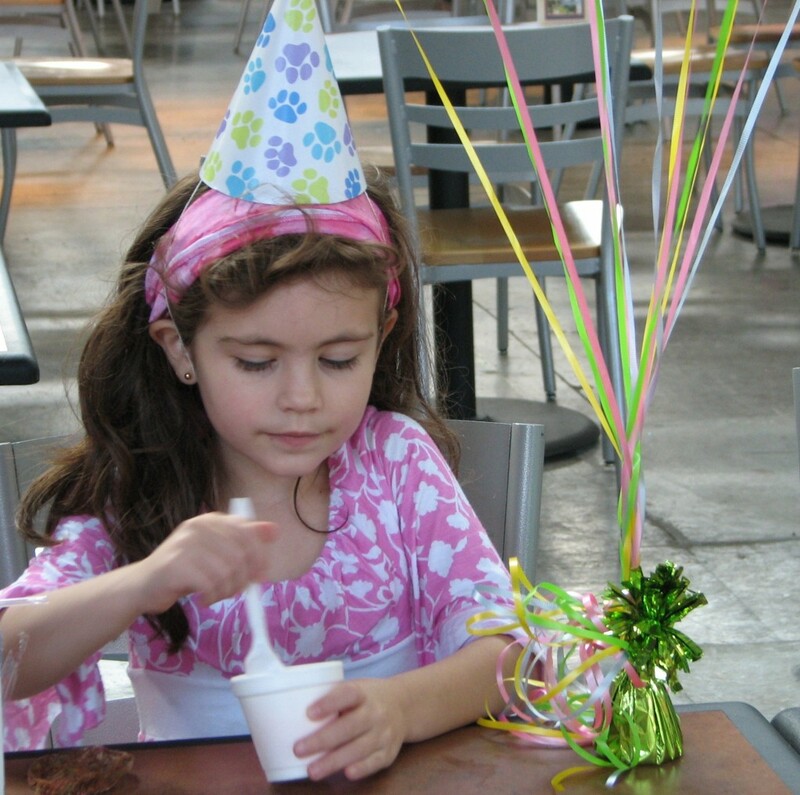 We are dropping the food off this weekend, and I expect my Birthday Girl (Oh, goodness, she is almost 6!) will even further see the good she and her friends did while they slurped up snowballs on a warm, November afternoon. Happy belated birthday to Maria, she looks so adorable. You should be very proud mama! As a NOLA native, transplanted to GA, I do miss the snowballs. There is nothing in the world to compare to a NOLA snowball. And so cheap, cheap!! Thanks for the shameless plug Carrie. We had a blast serving Maria and the crew. You’ve given me a great party idea for the winter. Don’t forget, the ice cream stores don’t close, so why should we? Thanks, guys…Yoly, I am so proud of her. Cubana Grits, come to Nashville. I will personally take you to meet Tanisha. And, Tanisha, it was a great, great party. You rocked it with all those kids…Just be aware, the next party will be a Booze Ball — no kids, and adult beverages we can put in our Snowballs. Si? I don’t live in Nashville, but you’ve given me an awesome birthday party idea. Thanks!